The window treatment industry has exploded over the last decade. Today, there are more product offerings in hundreds of new styles, colors, fabrics and operating systems that makes finding the right window covering a bit overwhelming. From horizontal and vertical aluminum, wood and fabric blinds, honeycomb, pleated, roller, Roman, woven wood, shutters to remote control and home automation. 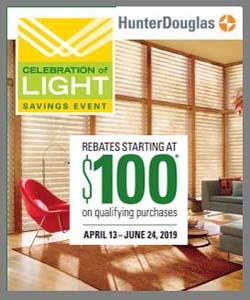 So, if it has been awhile since you have purchased blinds, shades or shutters, get ready to learn about all the possibilities available. 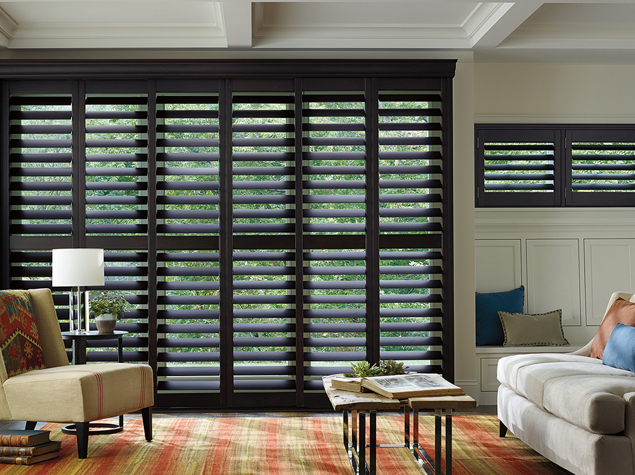 Shutters or sometimes called plantation shutters have long been a favorite when selecting a window covering. Today, there is a shutter to fit any room and any budget. Hardwood Shutters – available in a large selection of stain and paint finishes and are like a fine piece of furniture on the window. Faux Wood Shutters – durable and made from a combination of real wood and modern-day materials are perfect for any room. Poly Shutters – poly compound is UV resistant and guaranteed never to crack, chip, fad, warp or discolor. Perfect for high moisture areas. Window Shades are evolved over the years. 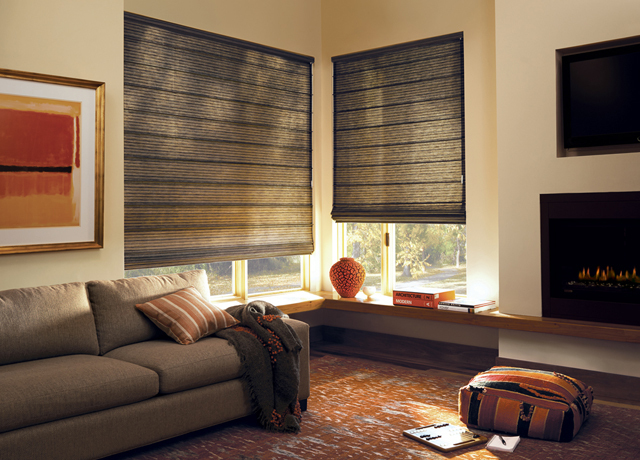 From clean and sleek to fun and earthy there is a window shade that will compliment any room decor. 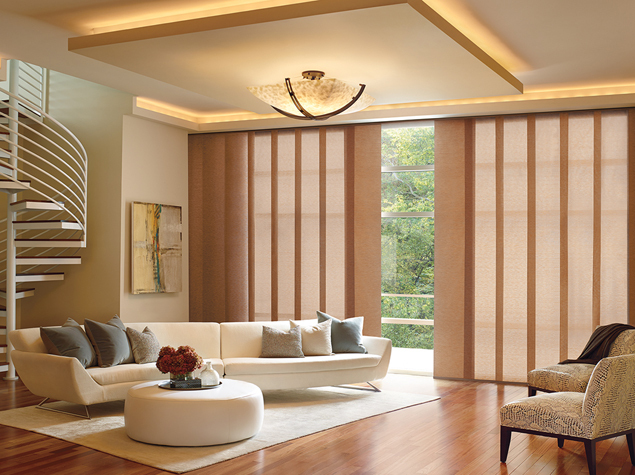 Honeycomb Shades – the most popular, versatile and energy efficient shade on the market today. Available in 3/8″, 3/4″, 1 1/4″, 1 1/2″ cell size in single, double, triple pleats and honeycomb within honeycomb construction. Honeycomb shades offer a clean look at the window has the largest color section, fabrics in light filtering, blackout materials and available in horizontal and vertical applications. Roman Shades – beautiful fabric shades in cotton, linen and silks. Traditional Roman shades open with a cord mechanism to adjust the height with a cord run vertically on the outside and stack up evenly when opened. Woven Wood Blinds – make a statement with hand-woven light-filtering woods, grasses and reads in light filtering and opaque materials. 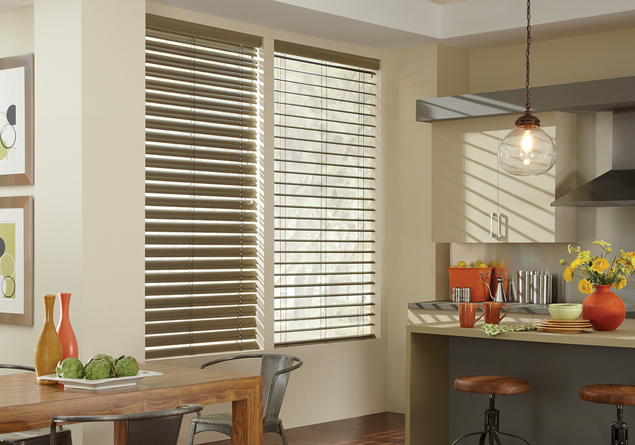 Woven wood blinds are available in five styles that will transform light into a design statement. 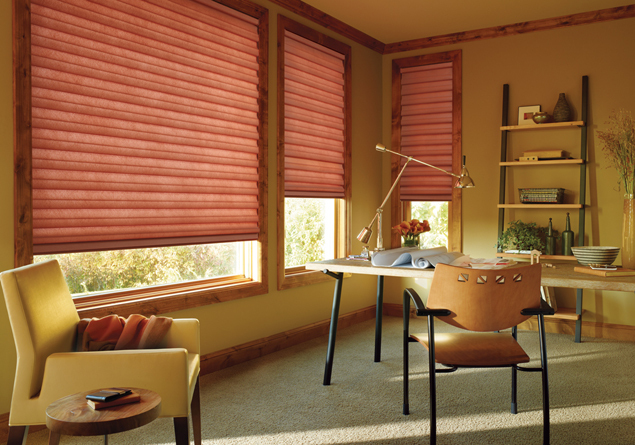 Pleated Shades – fun and casual, pleated shades come in bold patterns and colors that will brighten any room. Corded, route holes allow light to dance into the room. From light filtering to opaque fabrics. Roller & Screen Shades – timeless, roller and screen shades offer excellent UV protection and come in hundreds of fabrics, patterns and solids – sheer to opaque. 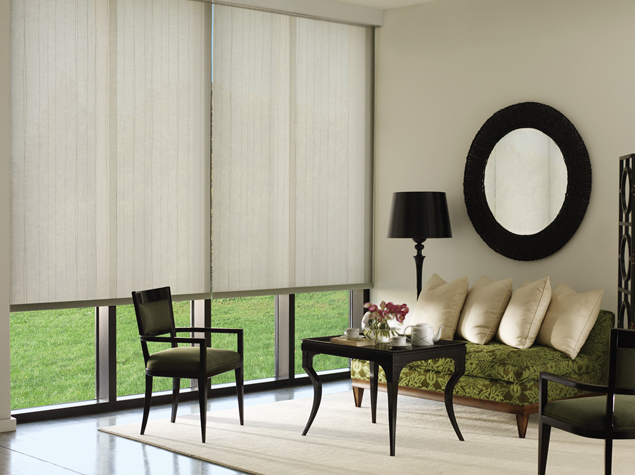 Easy to clean fabrics make a roller shade perfect for any room, especially for sunrooms and patios. 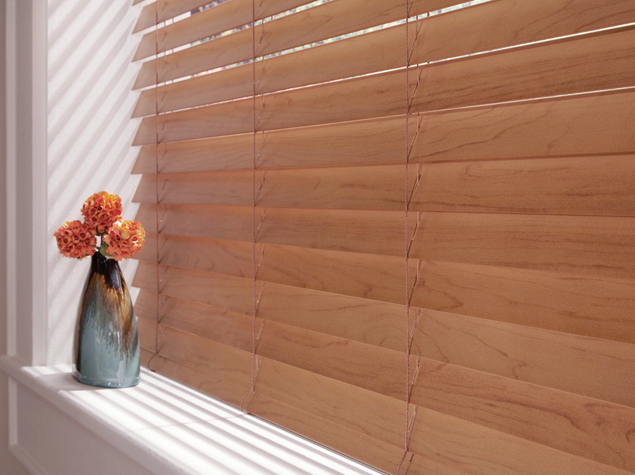 Wood blinds provide warm and charm to your home and are easier on your wallet than traditional wood shutter. Hardwood Blinds – made for 100% basswood and available in 1 3/8″, 2″, 2 1/2 slat sizes in offered in the widest selection of stains colors and paints. 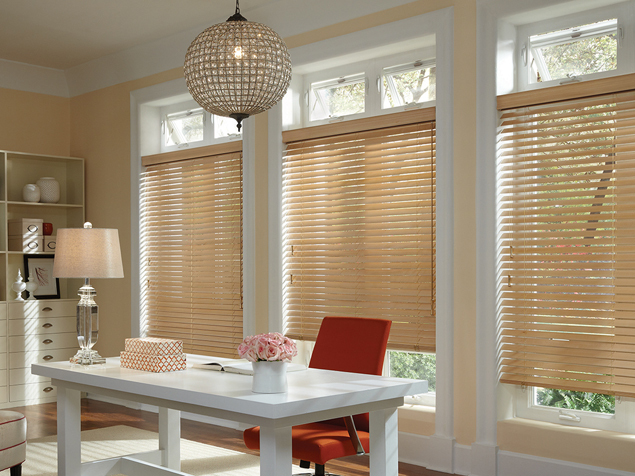 Faux Wood Blinds – built to withstand humidity and heat, this is the most comprehensive collection available in 2″ & 2 1/2″ slat sizes in realistic grain patterns, stains, paints and beveled and flat options. 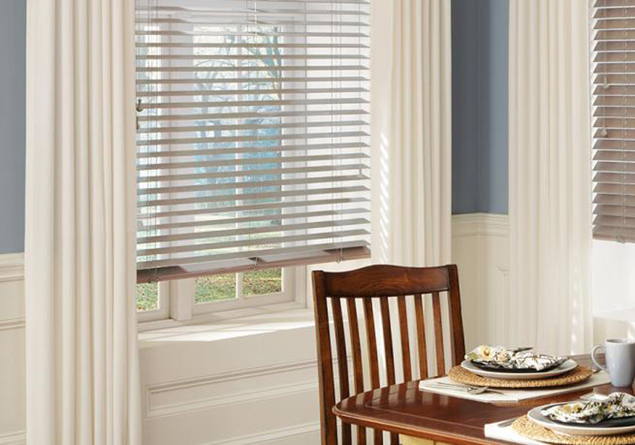 Aluminum blinds are not the like the old venetian blinds of yesteryear. They are made of flexible aluminum, that are practical and attractive at the same time. 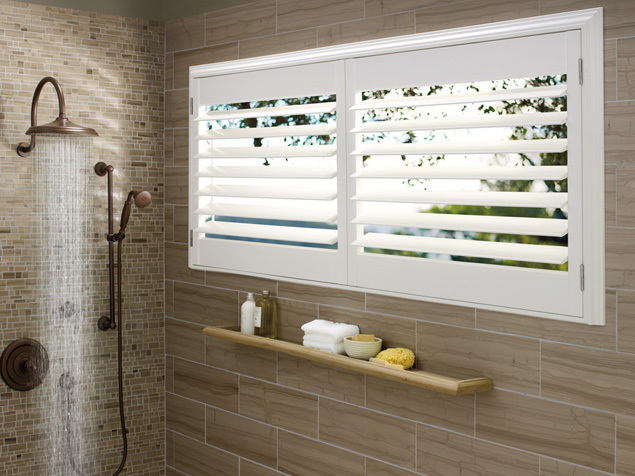 Available in 1/2″, 1″ & 2 ” slat sizes in a variety of colors with or without a beveled headrail for a sleek look. 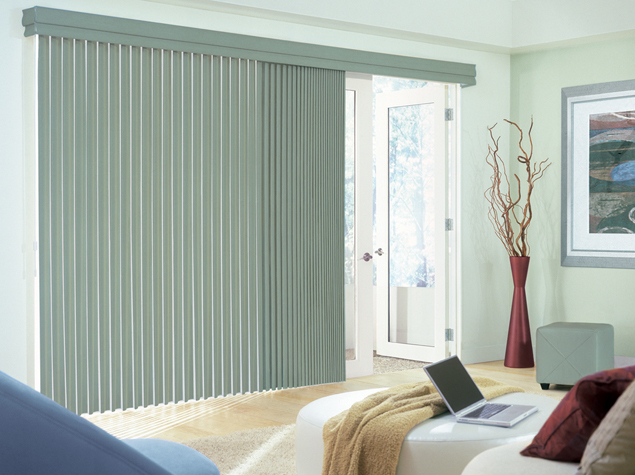 Vertical blinds are a perfect option for sliding and patio doors and have taken on a whole new life. 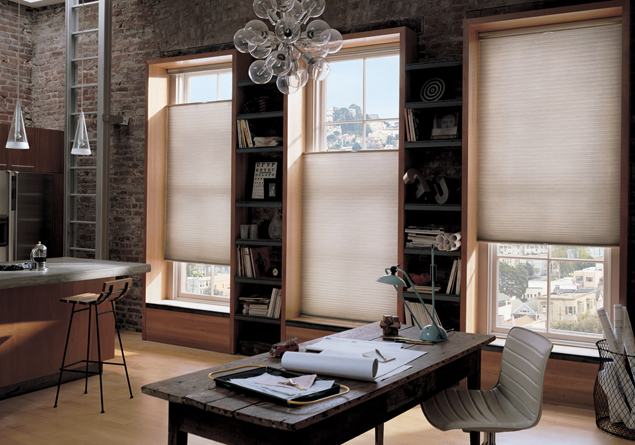 Today there are many options that even coordinate with your horizontal blinds and shades. Sliding Panels – a panel track blind that is available in variety of panel sizes and can even be used as a unique sliding room divider. 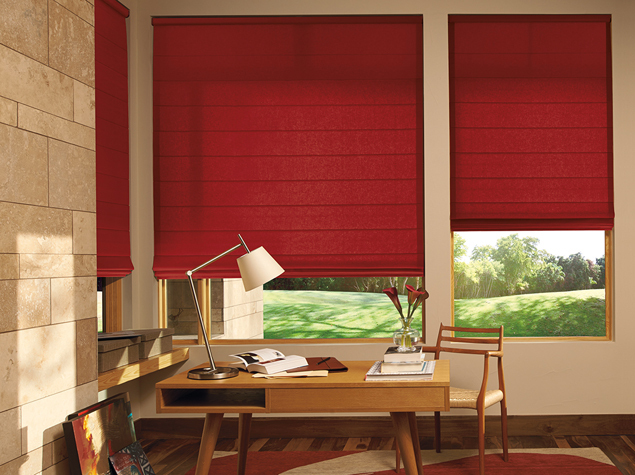 Vertical Blinds – come in vinyl, fabric and wood materials and in a variety of colors and patterns. Vertical Honeycomb Shade – same great honeycomb construction, turned vertical on a moving headrail track. Available in a left, right or center draw. 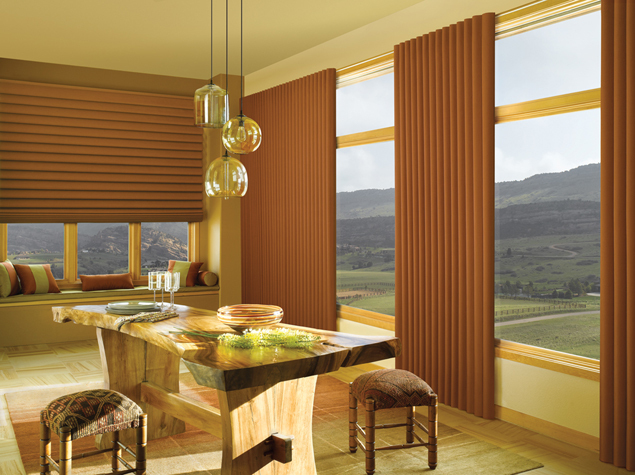 Hunter Douglas, the leader in window fashions, has taken the lead in product innovation. The following are some of their most popular proprietary products that take window treatments to a whole new level. 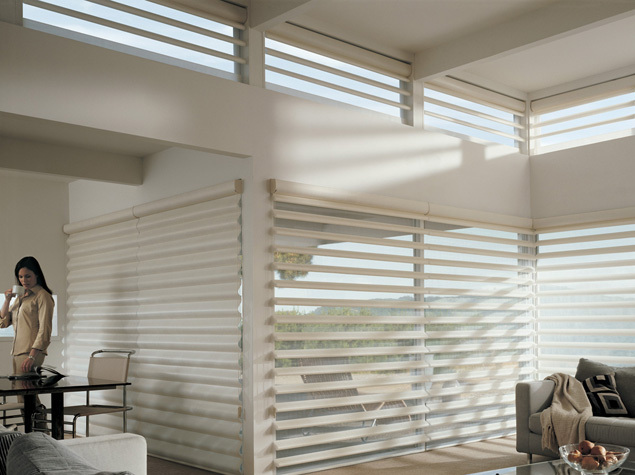 Silhouette® Window Shadings – diffuses harm sunlight, with the Signatures S-Vane™ that floats between two sheers. Just tilt the vanes to the desired level of light and privacy. Pirouette® Window Shadings – Contemporary shading features a soft fabric vanes attached to a sheer backing that allows natural light into your room. In the closed position, the shading looks like a modern. Luminette® Modern Draperies – The look of a drapery with the ease and operation of a blind, offering consistent contoured fabric. Vignette® Modern Roman Shades – a new take on the traditional Roman Shade with consistent folds and no exposed rear cords to clutter the window. Available in 4″ full fold or 6″ flat fold, select from luscious fabrics. 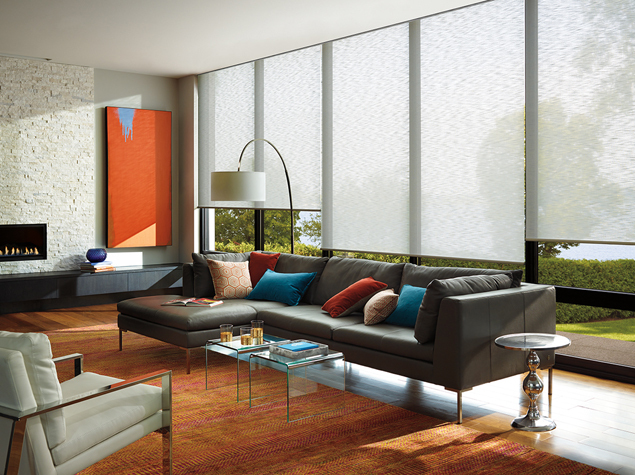 Solera® Soft Shades – The only soft shade with a cellular construction. Made from woven and non-woven fabrics, they can be light-filtering or room-darkening. Select from hundreds of fabrics, textures and colors to find the perfect drapery or top treatment to add warm and excitement to any room. 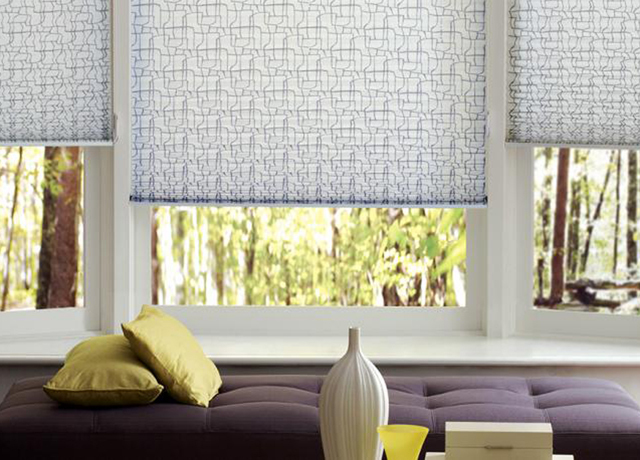 Use alone or in combination with your blinds and shades. 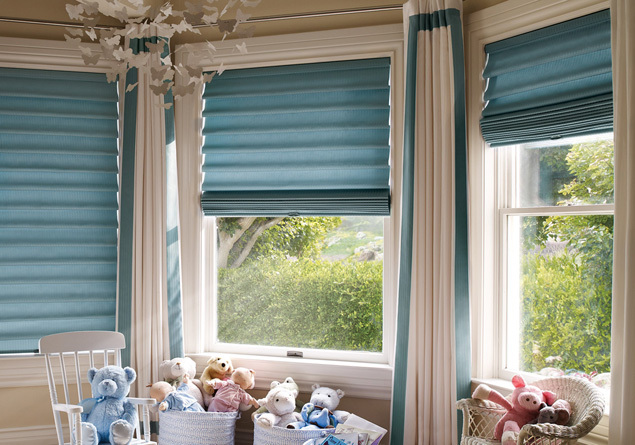 Child and pet safety is incorporated in every window treatment we sell and is why we offer a number of operating systems. We will find the operating system that best meets your lifestyle. Shutter Guy is your shutter and window treatment expert in the Charleston, SC area. We also serve Goose Creek, Summerville, Isle of Palms, Sullivan’s Island, Folly Beach, Mt Pleasant, Seabrook Island, Awendah, and surrounding areas. 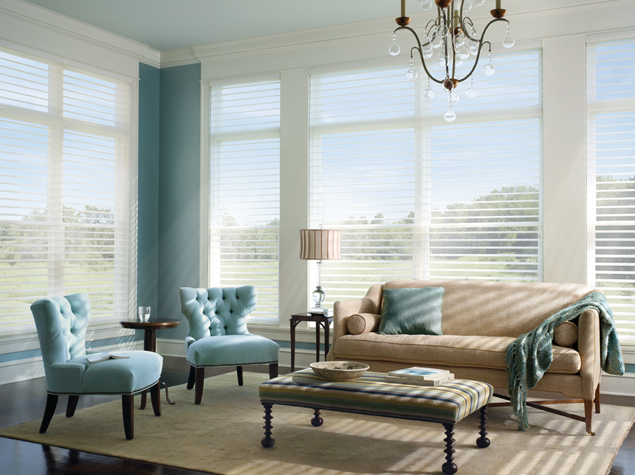 Call Shutter Guy today to schedule your free in-home consultation to find the perfect window treatment for your home.